There are a number of animals residing in Guyana that you won’t be familiar with. Unless you frequent zoos and safari parks around the world, there’s actually a good chance you’ll never have seen a lot of them. With this point in mind, it’s important to consider the possibility that you might encounter something you’re not especially knowledgeable about. 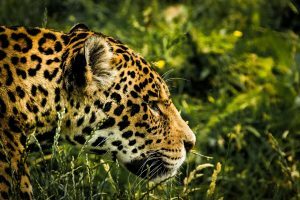 In order to ensure you don’t harm yourself, or the animal, you’re going to need to have some idea about how dangerous the animals you could encounter are. It’s unlikely you’ll see a jaguar if you join us out here in Guyana, and that’s because they’re one of the best predators in the world. They are experts in the arts of hunting and camouflage, and constitute one of the most dangerous animal species on our list. Their ability to crush skulls with one bite gives them a fearsome reputation, and rightly so; thankfully, human attacks are extremely few and far between, with the vast majority preferring to leave the area rather than engage with people. Avoid a face-to-face encounter with this big cat at all costs. You’ll come off worse. Caiman, often confused with crocodiles, are rightly considered a dangerous animal. They can grow to lengths of up to 13 feet, which is a formidable size for any predator. They’re quick on land, but much, much quicker in the water. 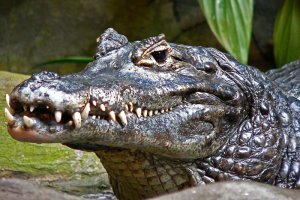 Their ability to hunt improves dramatically as soon as they’re in their preferred habitat, so it’s probably best to stay out of any body of water that might contain these reptiles. While they’re more likely to target other species over humans when it comes to potential prey, they will attack if provoked (so don’t get too close). Again, steer clear of this reptile, whether or not you’re in the water. Another species with an extremely fierce reputation! Whether or not a piranha’s reputation is fully-deserved is, interestingly, a matter for some debate. Despite the central plot of a number of popular films revolving around thousands of hungry piranhas turning people into skeletons in under ten seconds, fatal attacks are extremely rare. 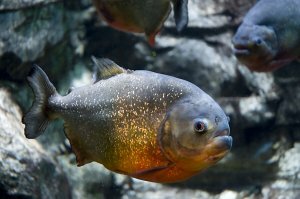 Sure, they can give you a seriously painful bite, but the chances of piranhas actually targeting humans as prey are low. Stay out of the water, and you eliminate any chance of this fish harming you. The giant otter perhaps isn’t an animal you’d have expected to see on our list, but we’ve included it for good reason. They may look harmless, but disturb their nest or threaten them, and they’ll do you some serious damage. 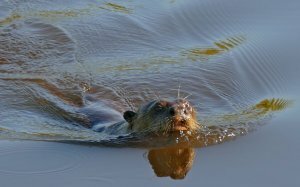 We’ve mainly included the giant otter to emphasise the fact that everything in Guyana’s jungle is wild. Not only does that mean that they’re not used to humans, but it also means they’re fighting for survival. If there’s even the slightest whiff of that being threatened, they’ll defend themselves. The giant otter shouldn’t be dangerous to humans, provided we don’t get too close to them or their young. The key point to remember when it comes to any of these animals is centred on respect. In 15 years we have not had one minor, let alone serious, problem with these creatures so respect the animals you encounter in Guyana and you should be absolutely fine. This entry was posted in Jungle Survival, Latest News, Safari. Bookmark the permalink.